A vat of acid. A haunted house. Severed heads. Is it all real or just some wild concoction put together for the execution of a murder? 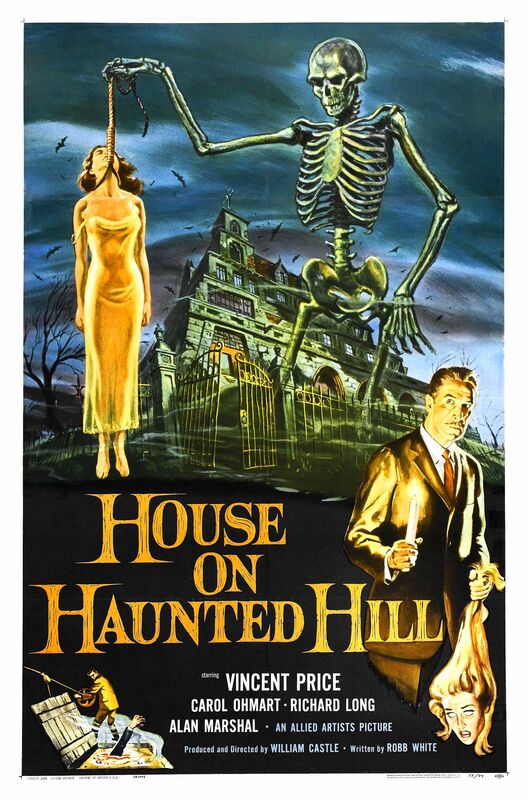 Nobody is really sure, but Vincent Price keeps the mood extremely creepy in this horror movie from the late 1950s. Eccentric millionaire Frederick Loren(Vincent Price) has invited five strangers to a party in a supposed haunted house and offered them $10,000 each if they can stay the night. As the party gets underway, the strangers realize that they are in for more than they had expected. Annabelle Loren (Carol Ohmart) is Frederick’s wife, but the pair seem to have a contentious relationship to say the least. They banter about killing one another in a manner that you believe that they have tried before. I enjoyed the unexpected dialogue between Vincent Price and Carol Ohmart. They had a distinct chemistry between them that really made you believe that they were in the middle of a bizarre game of who could murder the other first. The other main party goers included office worker Nora Manning (Carolyn Craig) and pilot Lance Schroeder (Richard Long). These two were at the heart of most of the action as the party continued. Watson Pritchard (Elisha Cook) was quite crazy, constantly talking about the previous murders that had taken place in the house prior to this party. He was very spooky. Dr. David Trent (Alan Marshal) has his own secrets for being included on the party guest list while Ruth Bridgers (Julie Mitchum) seemed to be included to drink scotch. There are some twists and turns here that are tricky and reasonably fun. The film works in particular because of Vincent Price and his undeniable creepiness factor. IMDB has a listing for “Skeleton” playing himself.